This Matthew 15-30 Workout is based on Matthew 15:30. I was using this verse and the next one to meditate the other morning. To do this, I imagined the scene: the weather, what the people looked like, what they were feeling, what Jesus was feeling, what the whole situation would look like to an outside observer. Then I break apart the verse or actually I kind of just let it fall apart on it’s own. When you meditate slowly, it’s kind of like cooking meat slowly. It just falls off the bone. Anyway, this is how the verse “fell apart” for me. A vast crowd- imagine how big. This crowd was 5000 men and who knows how many women and children. So I estimate 10,000 in my mind. It’s probably a lot more. brought to him people-so the healthy people were bringing the hopeless to Jesus, they were helpless some being carried, some being led. What were the people feeling that brought them? What were those feeling that were being brought? 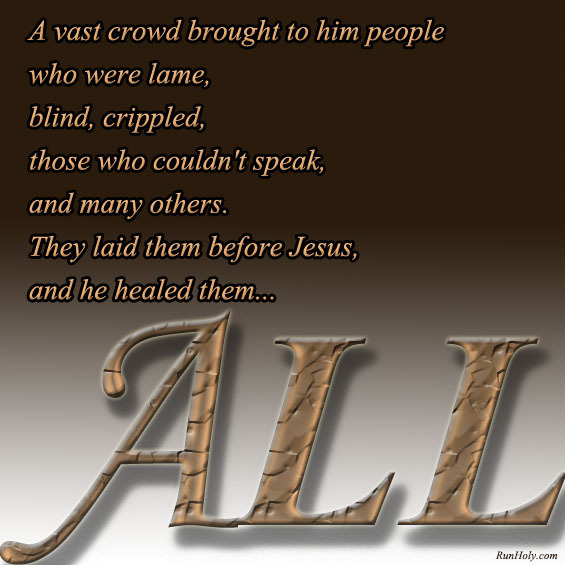 who were lame, blind, crippled, those who couldn’t speak, So a crowd is laid out before Jesus needing his help, needing healing, looking to him either with their eyes or with their hearts. and many others. Hmm… who were these? What did their “sickness” or “handicap” involve? all. All means all. That’s pretty intense. When you see the scene in the next verse, it is incredibly moving. All of these people running around, shouting, crying through new sight, praising God with the purest joy. Holy Ghost party!